For this fortnights Scripture Challenge, Patter gave us the word "Forgive". 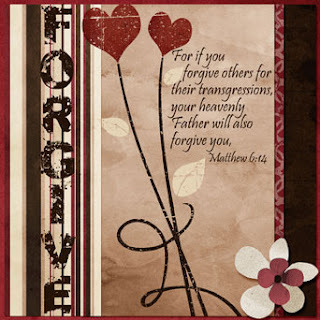 Her devotional thoughts were about both God's forgiveness of us through the price the Jesus paid for us on the cross and our need to forgive others. So I chose a Bible verse which sort of covered both those thoughts. For my digital art I used a kit called "Adoration" by Lilley Scrap Designs which I purchased from a store called Digiridoo Scraps. The fonts I used were Soul Mission for the word forgive and the scripture is Pristina. What a beautiful page Anne-Marie! Wonderful -- I love those fonts.